The motors of your drone is what your propellers are connected to which cause them to spin around and generate thrust to enable your drone to fly. In the case of fixed wing airraft, the motors generate a forward thrust to push your plan forwards through the air. In the case of multirotors, the motors generate upwards thrust which keep your drone such as a quadcopter flying. 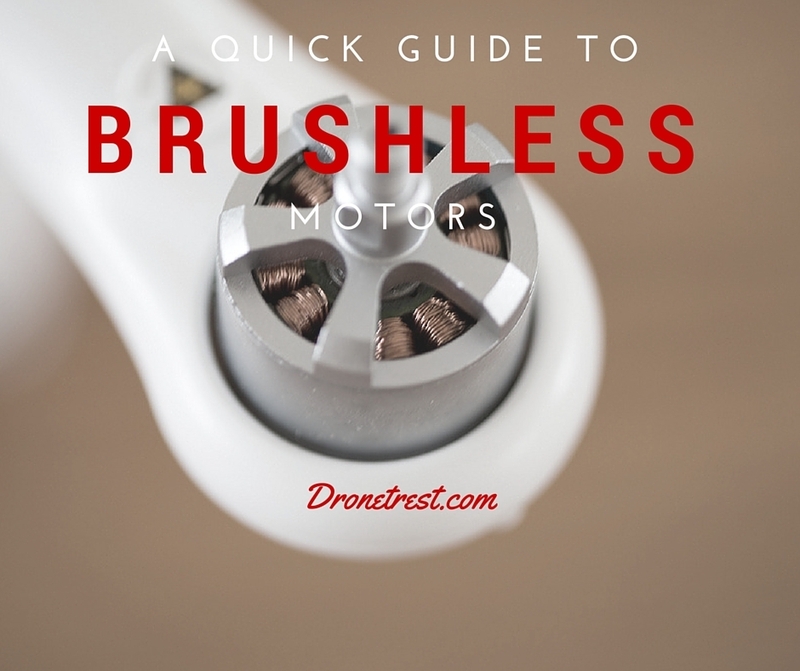 Without going into too many technical details this guide will cover the baiscs of what you need to know in order to know all the things you need to know about when using brushless motors. Simply put, a brushless motor contains a bunch of electromagnets (coils) which are connected together in specific pairs. The motor controller (commonly known as the electronic speed controller or ESC) is the device that controls the motor by activating and deactivating specific sections of electromagnets in the motor at very specific times to cause the rotor of the motor to spin due to the magnetic force. These electomagnets are connected into three main sections which is why all brushless motors have 3 wires coming out of them. There are two categories of brushless motors however with multirotors and most fixed wing aircraft you will only encounter out-runner motors are pictured above. The difference between the two is that out-runners have the rotor on the outer area of the motor, and in-runner motors have the rotating part on the inside while the outer shell remained stationary. In-runner motors are often used with R/C cars as they can spin much faster than out-runner motors. However out-runner motors are able to produce more torque which allows them to drive larger propellers used on aircraft and multorotors. As you shop around for some brushless motors you will notice that there is often a trend in motor naming with a series of 4 numbers and might wonder what those numbers mean. It’s simple enough; most motors have a few letters followed by 4 number. the letters hold no significance (usually a model or series name, such as MT series motors, or Q series for quadcopter), whereas the numbers tell you the essential measurements of the motor. Generally, the first two numbers indicate the diameter of the entire can of the motor OR the diameter of the stator (the inner part of the motor) only. Please see the picture at the below for clarification. Similarly, the second pair of numbers can indicate either the height of the entire motor, or only the height of the stator. In this case of the MT2204 motors that unmanned tech, these numbers indicate the stator diameter and height, and so we have an 22mm stator diameter, and a 4mm stator height. The size of the motor can give you an idea about what size drone you will use with the motor. Typical FPV racing miniquads will use 1806 or 2204 motors, whereas larger quadcopters that are designed to carry a gopro camera will typically be around the 2212 size. Note: The ideal number of rpm of a motor for you is dependent on what type of copter you’re looking for. For example, if you’re looking for a high performance, acrobatic copter, a high rpm motor is the one for you, meaning of course a high Kv rating. This is intuitive because these acrobatic copters are generally of the smaller variety, meaning a smaller motor, leading to smaller propellers. When you have these smaller propellers, the motors need to produce more rpm in order to produce the necessary thrust. However, this means that these motors use up more power than others, and so are less efficient. On the other hand, if you would like your copter to use the least amount of power as possible, and so last longer and be more stable, then motors with lower rpm are ideal. An example for when these types of motors would be useful is in taking aerial photos. Again, this is partly due to the fact that the type of copters used for this these tasks are bigger in order to carry the necessary equipment, meaning larger propellers, which will create more thrust when rotated. They therefore require fewer rpm. The configuration number tells you how many electromagnets there are on the stator, and the number of permanent magnets there are on the rotor. The number before the letter N shows the number of electromagnets there are in the stator. The number before the P shows how many permanent magnets there are in the rotor. Most out-runner brushless motors follow the 12N14P configuration. There are some specialist low KV multirotor motors which have a higher number of electromagnets and permanent magnets which allow the motor to create more torque more efficiently, however due to the added number of magnets these motors are more expensive. When investigating and looking into which motors to buy, there are a few terms that are useful to know and recognise. This text takes you through some of these with brief explanations. The next important feature for anyone considering motors is efficiency. It is intuitive why high efficiency is desired in any motor as they can run for longer, and higher efficiency results in less heat produced. If this is the case, the motors can be pushed harder at any given moment, or over a long period of time. The power in is calculated using the formula V × I where V is voltage and I is current. Intuitively, the power out of the motor is the power put into it, minus the energy that is necessarily lost i.e. power out = power in− power lost. There are two main ways that a motor can lose efficiency; copper loss and iron loss. This is measured in Watts. Referring back to the note earlier in the text, choosing the right motor for you depends on what you would like out of your copter. You need to balance efficiency against thrust produced depending on the use. For acrobatic copters, you may need loads of rpm but efficiency may not be at the forefront of your mind. If you’re looking for longer flights where your copter can retain stability, you may favour efficiency over thrust. For more information on this please see this post below. This would be a far better guide is the images/links still worked. Any chance they can be fixed?